Per Jacobsen: “Thorvaldsens Museum – New Courtyard Pavement”, in: Meddelelser fra Thorvaldsens Museum, 1997, p. 178-179. The original pavement was laid in the 184O’s on the basis of a design by the architect M. G. Bindesbøll modelled on an antique racecourse in white on a dark background. This motif combined with the horse racing geniuses on the walls of the courtyard created an artistic unity around Thorvaldsen’s grave. In 1850 the pavement was described in detail in a paper by J. F. Holm: Guidelines for the Execution of Fresco Paintings, Stucco and Cement Mosaics. According to this paper the pavement was originally constructed using cement mortars in two colours. It is stated that the slabs were produced in a continous process and that the surface was finished by glazing with a steel float. After a period of decay a rehabilitation of the pavement was carried out by Kaare Klint with the assistance of Mogens Koch in the 1920s. The substrate was compacted by water saturation and tamping. The new pavement was cast in situ using a two-layer un-reinforced concrete with stretch metal forms dividing the pavement into slabs. The bottom layer consisted of 10 cm of lean concrete with a top layer consisting of white and dark cement mortar. The white cement mortar was produced using white cement and crushed white feldspar. The black mortar was produced using ordinary Portland cement with a mineral addition of carbon black and crushed dark labradorite as fine aggregate. After removal of the strech metal forms the surface was grounded (terrazzo polished) and the joints sealed with a hot poured bitumen sealant. For reasons unknown today the originally designed and published surface level plan was not met, which reduced the effectiveness of the drainage. State-of-the-art technologies were applied during this restoration of the pavement, but after many years of exposure to saturation and frost the pavements were in 1995 in such a condition that a renewed rehabilitation was urgently needed. It was decided to carry out a complete reconstruction of the entire pavement; the deteriorating concrete was removed and a new base course consisting of 70 cm well compacted gravel was installed. After the placing of the pre-cast concrete flagstones gutter and boundary, the gravel base was covered with a geotextile and the concrete was cast with a slab thickness of 10 to 12 cm. The slabs were cast in one layer without reinforcement. Two types of concrete were used to obtain the original colours:The white concrete was composed using white cement, 0/2 mm and 6/9 mm crushed Carrarra marble aggregates. For the dark concrete an ordinary Portland cement was used in combination with a carbon black colouring agent, quartz sand 0/2 mm and crushed labradorite aggregates from Tjølling in Norway. The concrete compositions were developed on the basis of an extensive pre-testing programme, which included petrographic analyses and accelerated frost testing. On the basis of these tests it was decided to use air entrained concrete. The concrete was cast in lanes following the original design from the 1840’s, starting with all the dark-coloured concrete areas. The surface of the concrete was cured with a membrane curing agent and, subsequently, divided into the designed slab size by diamond sawing at a maturity of approx. 20 hours. The white concrete lanes were then cast and treated in the same way. After hardening the surface of the concrete was ground and polished applying the terrazzo technique which was also used for the original pavement. The construction and contraction joints were cut into equal widths and filled with a bottomstop and argillaceous unigrained gravel. The drainage system has been renewed, using the original bronze cast outlet gratings. The geometry of the pavement is now in accordance with Kaare Klint’s original intentions, which has resulted in an improved drainage. As a consequence, the centre of the pavement in the atrium has been elevated by 9 cm and the level of the flower bed over the grave has been raised correspondingly. Fig. 109. 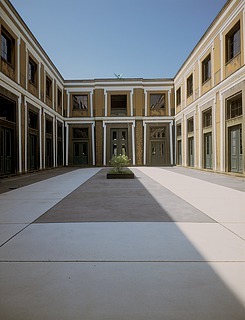 The courtyard of Thorvaldsens Museum after the renovation 1995. To secure the burial chamber and the store-room cellar in the eastern part of the courtyard against water penetration these structures have been insulated with bituminous membranes. In conclusion it should be mentioned that all participating consultants, contractors and their personnel at all levels have made their theoretical and practical skills available to the task with enthusiasm and commitment. The renovation of the courtyard was financed by a grant from the foundations of the bank Bikuben and the City of Copenhagen.